Japan’s visiting Foreign Minister says his country would still be prepared to export its submarines to Australia if protracted contract negotiations between Defence and French company Naval Group eventually collapse. In a wide-ranging interview with the ABC before departing Sydney, Foreign Minister Taro Kono also signalled Japan would be willing to conduct joint maritime patrols with Australia in the South China Sea, and expressed hope that troop rotations would occur “soon”. Last month the ABC revealed growing government frustrations with Naval Group over the $50 billion future submarine project, and concerns that a key strategic partnering agreement is unlikely to be signed before the end of the year. In his only interview following talks with Foreign Minister Marise Payne and Defence Minister Christopher Pyne, Mr Kono said Tokyo would be willing to step in if Australia decided to look at other options for the replacement of the ageing Collins Class fleet. “That’s possible – but it’s up to the Australian government to decide,” Mr Kono said. In 2016 Tokyo expressed deep disappointment after the Turnbull government awarded the lucrative submarine contract to the French over rival Japanese and German bids. Mr Kono stressed he did not know how long it would take Japan to prepare another offering if Australia were to again approach his government. “Well I have to check with (the) Defence Ministry and related industry,” he said. 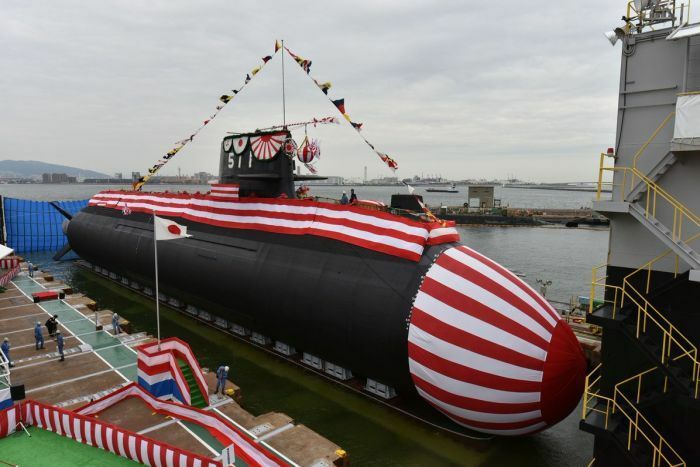 Last week Japan celebrated the launch of its latest Soryu-class submarine, Oryu, the first of the fleet to be powered by lithium-ion batteries. According to Euan Graham, a senior fellow with the Lowy Institute, Japan’s original bid to build Australia’s future submarines fell short of Defence’s required technical standard, even though the Soryu-class submarine is currently the largest conventionally powered submarine in operation. “If negotiations were to break down with France, Defence faces a daunting decision about whether to go back to the drawing board, including perhaps revisiting the nuclear-powered option,” Mr Graham said. During Wednesday’s high level talks the Foreign and Defence Ministers of Japan and Australia discussed options for closer military and security cooperation as part of Tokyo’s strategy for a “free and open Indo-Pacific Strategy”. Mr Kono said it was possible Japan could eventually conduct joint maritime patrols with Australia in the contested waters of the South China Sea. “Our maritime Self Defence Force makes strategic port calls in ASEAN countries and there are a lot of things we can do together,” he said. The Japanese Foreign Minister also confirmed that a “Status of Forces” agreement with Australia was close to being finalised. The deal would allow military personnel to travel to both countries to conduct joint training exercises. “This agreement is very important for our cooperation. We have made significant progress, there’s only a few issues left to be solved, so we are hoping by the end of this year we can basically get agreement,” he said.